Joe R. Lansdale wrote my favorite short story in the Stories: All-New Tales collection, so when I saw a library display featuring a young adult novel by him, I didn’t even read the book jacket before I checked it out. 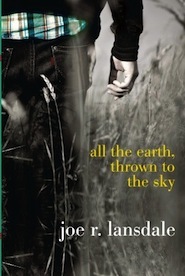 When I was only ten pages into All the Earth, Thrown to the Sky, I was sold. It begins during the Great Depression in Oklahoma, where the horrid sandstorms ruin crops and cause bloodcurdling respiratory diseases. Jack Catcher’s mother has died from a respiratory disease and, for reasons not fully explained but yet understandable, Jack’s father has just hung himself in their barn. Jack buries his parents and sets off to Old Man Turpin’s house for help, only to find Turpin has drowned in sand while sitting on his front porch. Things do not start off great for Jack. Jack quickly realizes he needs to leave Oklahoma and takes Old Man Turpin’s car and embarks on a journey where things don’t really get that much better. He runs into gangsters, rides the rails, falls upon a group of gypsies, works in a farmer’s field, and so much more. These things don’t always go well for Jack, but at least he has some sidekicks. A couple of kids from his hometown go with Jack on this journey, and wannabe journalist Jane would be a great sidekick. She can tell a story like a seasoned veteran. All the Earth, Thrown to the Sky ends differently than it begins. It really feels like two different tales. After reading the first chapter and getting such vivid descriptions of the sandstorms, I thought this was going to be about the struggles of a teen during the Great Depression. But the feel of the story really does turn from a depressing Great Depression tale to one about a boy’s growth as he goes through backwoods, small town America. Completely outlandish things happen to him on his journey and it doesn’t feel connected at all to the descriptive tale’s beginning. But I still really liked this book. Even though it did change and did not end up at all where it started, it was a good coming of age tale. I just wish it stayed in Oklahoma and I could hear more about the sandstorms and struggles because I think that would’ve been more interesting. It started off so strongly with this and I was completely on board. The tale isn’t as strong by the end, and sometimes it’s utterly absurd, but I can still give it a thumbs up. I just hope Lansdale realizes how strong he was at the beginning of this story and he writes something more complex and challenging next time.